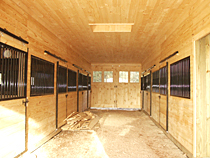 On this page, we show most often used options that customers order or add to their horse barns or garages. By no means this is a full list of options we offer. 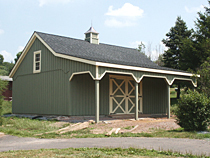 Cupolas - Perhaps, one of the most popular option requested for any horse barn or garage is a Cupola and a Weathervane. 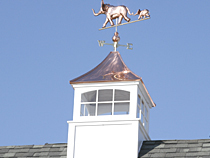 We have many different styles of cupolas and weathervanes available to enhance the look of your barn. When Cupola is installed, it can either be made functional with hole cut out in the roof or decorative. Our cupolas are built by a small Amish company in Lancaster County, PA. Cupolas are built either out of Cypress wood or Azek as a maintenance free alternative. 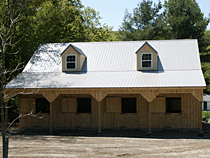 Lean-to (large overhang) - Is also a very popular option on our barns. Lean-tos come in different sizes and may be built as an open style (as shown) or completely enclosed. Lean-to provides extra roof and more protection from weather elements. 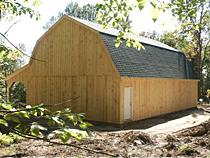 When lean-to is installed on a horse barn, it may also act as a horse shelter or run-in area. Lean-tos can be placed on one side or both sides of barn. Most of the lean-tos we have built were between 8'-14' with 10' wide being the most popular size. Gambrel Style Roof - Provides significantly more loft storage space and a different barn look. For looks only, Gambrel roof can be built with regular trusses as a more economical alternative or with Attic type trusses if only a small storage space is needed. To provide the most storage space with full loft, Gambrel roof is built with rafters. Finished Aisle Way Ceiling - As an option, you may choose to finish your ceiling in the center aisle way. This gives the barn nice and finished look. We use 1x8 T&G White Pine boards to finish the ceiling. Hay Drop Door - One of the options our customers often ask about, is the installation of hay drop door. The hay drop door is a very good option when you have a full loft. Single hay drop door can either be installed over the center aisle or each individual stall may have its separate drop door. 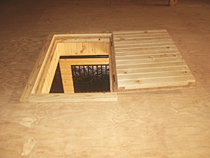 The disadvantage of several drop doors installed in the loft, is the decreased loft storage space. 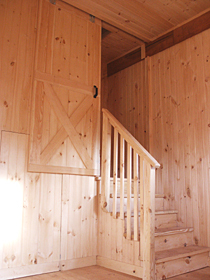 Sliding Stairway Door - In smaller barns, where loft stairway is installed inside of finished and heated tack room, it becomes necessary to prevent the heat from escaping through the stairway opening. Our solution that works well, is the installation of sliding stairway door at the stairway landing. Another option is to build a small room up in the loft at the stairway opening, but that set up is more costly and will require bigger room to heat.